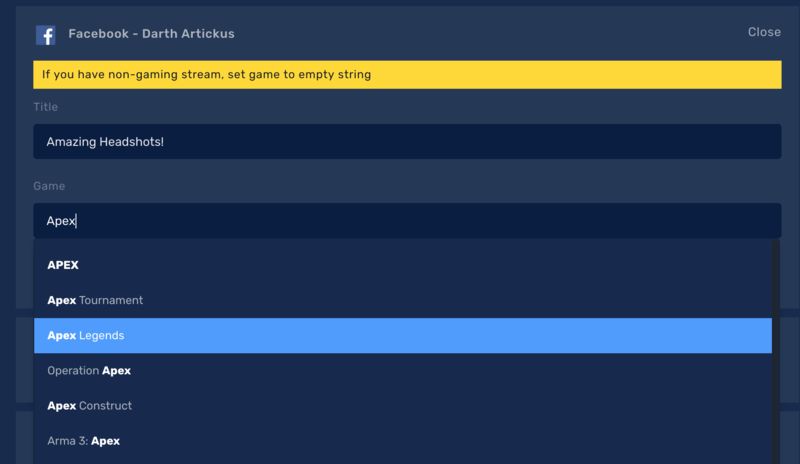 It is now really simple to let your followers and friends know which game you are playing when streaming to Facebook! 1. You need your Facebook to be added via API you can learn how to do it in the article provided below. 2. Head over to the Titles section on your Restream Dashboard. 3. Find your connected Facebook channel and click on Edit. 4. Set the title if needed and start typing the game name. As soon as you find the proper game choose it from dropdown update. Important: Keep in mind that the game will be shown only for public pages and your profile, it will not work with groups.